Gatwick Greenspace Partnership, now part of the Sussex Wildlife Trust, has leased Lower Orlton’s Copse*, near Rusper, on an initial three year agreement with the aim of improving the biodiversity in the wood, through a process of selective thinning and pollarding, and using the site for our Forest Schools project. We also liase with landowners, conservation partners and local authorities with the aim to improve, expand and connect our fragmented green spaces. Although we do not have a problem with Rhododendron at Orlton’s Copse, we do deal with it on many other sites. So as part of this drive, the Sussex Biodiversity Partnership recently held a “Controlling Invasive Rhododendron Workshop” at Tilgate Park in Crawley. The one-day event was hosted by us and aimed at providing practical solutions to the eradication of the invasive shrub Rhododendron ponticum from local woodlands. Representatives from local authorities, private landowners and organisations such as the Forestry Commission, the South Downs Joint Committee and the National Trust were given advice on the methods for best results in Rhododendron control, choosing and planning a control programme and information on grants available towards the cost of Rhododendron control. This was followed by a walk through Tilgate Park to highlight some of the issues discussed. This comes at a time when Rhododendron control is very much in the spotlight again, as it is a host plant to the pathogen Phytophthora ramorum, which has already caused widespread death of Oaks in parts of the USA. This deadly disease is now increasing its’ spread across the UK, affecting many Oaks and Larch trees here as well. 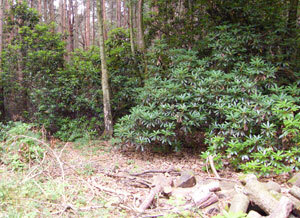 Even without the problems associated with P. Ramorum, Rhododendron ponticum is an invasive, non-native evergreen, which can spread rapidly and dominate the woodland under-story. It can have a severe impact on biodiversity through over-shading and the secretion of toxic chemicals into the soil, both of which restrict the growth of other plants. Sites that are being coppiced or clear felled, are also under threat if Rhododendron is present nearby and woodland owners are being urged to liase with their neighbours if Rhododendron is spreading across boundaries, otherwise any hard work will be undermined by new plants appearing from the land next door!